Preheat oven to 160°C (325°F). Line 3 x 22cm lightly greased round cake tins with non-stick baking paper and set aside. Place the water, cordial and butter in a small saucepan over medium heat and cook until the butter is melted. Set aside. Place the flour, bicarbonate of soda, almond meal and caster sugar in a large bowl and whisk to combine. Add the eggs, buttermilk, vanilla, lemon rind and butter mixture and whisk until smooth. Pour the mixture into the prepared tins and cook for 1 hour 10 minutes or until cooked when tested with a skewer. Set aside to cool in the tin for 15 minutes before turning out. To make the icing, place the butter, icing sugar and lemon juice in the bowl of a stand mixer and beat for 12 minutes, scraping the sides of the bowl until pale and creamy. To assemble the cake, trim the top of each cake to an even height. Halve each cake horizontally to make 6 even layers. Place the bottom layer on a cake stand or serving plate and, using a palette knife, spread with 1 cup of the icing. Repeat, layering the cake and buttercream, spreading the remaining icing over the top and sides of the cake, smoothing to finish. 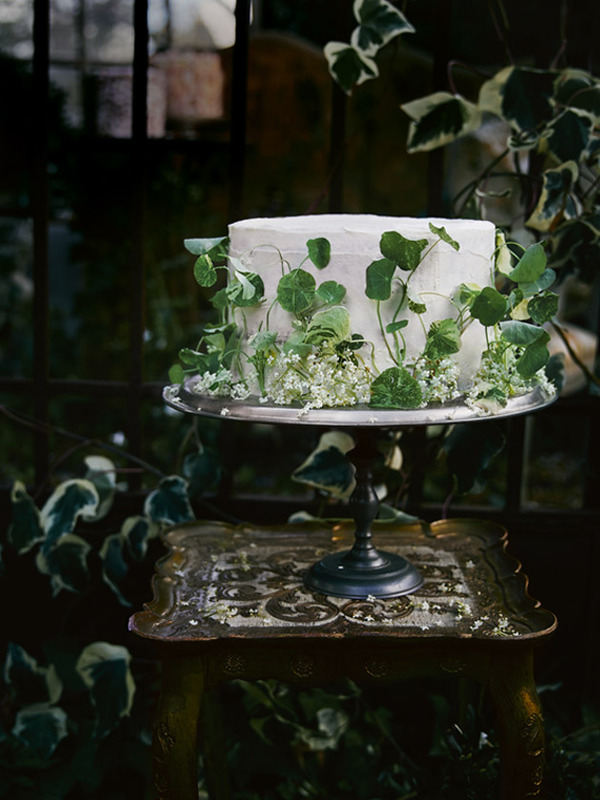 Decorate with nasturtium leaves and fresh elderflowers to serve. Serves 12–14. + Elderflowers are available from specialty grocers. This cake is the most delicious cake I have ever made. I made it for my sister’s baby shower and there was not one piece left.